Do you know the stillness of a cold winter’s night? The ground covered with softly falling snow, and a crisp silence that fills the air? 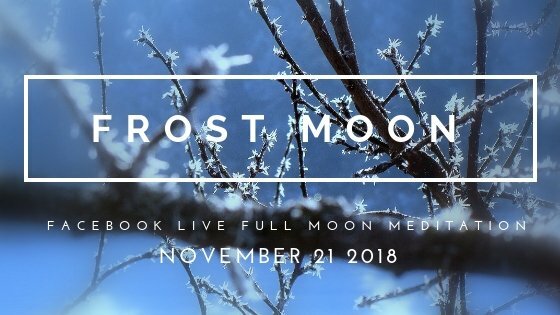 The first snowfall of the season is blanketing my city right now, and it’s perfect timing for the Full Frost Moon and the meditation I want to share with you. Winter is the only time of year when I slow down enough to stop and drop into a place of utter stillness–a place of timelessness, where there is no rush. Normally it feels like we’re running against the clock, always falling behind our list of to-do’s. Can you feel the difference in your body–how everything tenses inside when you’re rushing, and the spaciousness that arises from dropping into timelessness? A space opens up to be, to allow, to create… Instead of the contraction of shortage, it feels like the flow of abundance. That’s the beauty of following the flow of the seasons. Especially if you live in the Northern Hemisphere, where the frost of winter literally puts a pause on life, you are beckoned to listen to the natural rhythms of the earth and your body. Because–like the changing seasons and the waning and waxing of the moon–our female bodies also follow a cyclical rhythm. Have you noticed how your mood and emotions begin to turn inward during pre-menstruation and menstruation? Like the autumn and winter, it’s a natural time to slow down, pause and reflect. And have you noticed how your energy rises during the spring and summer and calls you outside? It’s the same outward call you feel during pre-ovulation and ovulation–because you feel more energized, action-oriented and social. If you’re not aware that your body follows these cyclical changes, and that these changes are in synch with where you are in your cycle, then you’re missing out on important clues about who you are as a woman. As we approach the end of the year, I would love for you to reflect on the messages from your own personal cycle, using this natural time of completion to turn inwards and listen to the wisdom inside. The luminosity of the full moon reflects even more strongly on the frost-covered earth. The light of the sun diminishes. The call of the sun is outward. The call of the moon is inward.